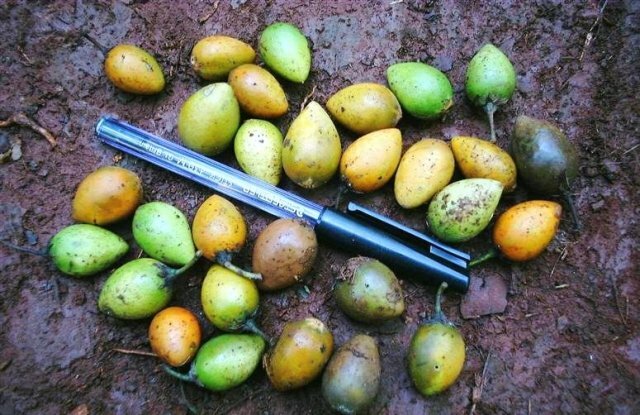 Omuna is a fruit growing in the forests of East Africa. It seems to have been originated in that part of the world. Though omuna bears sweet and tasty fruits, but still it is recognized more as timber than a fruit tree. 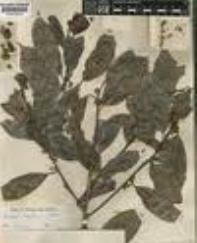 A tall evergreen tree with long straight bole, height up to 40 m; bark of twigs deep purplish-brown, rough and fissured; young branches and petioles puberulous, becoming glabrescent. Leaves elliptic to elliptic-oblong or rarely obovate-oblong, 5.5–12(–14) cm long, 2–5.3(–5.6) cm wide, apex shortly acuminate or ± cuspidate, cuneate; upper surface with slightly raised nerves, lower surface practically glabrous or with scattered hairs along midrib; lateral nerves and veins slightly raised, petioles 1–2(–2.3) cm long. Flowers fragrant, 2–4 per axil, ± pendulous; pedicels curved, up to 1 cm. in length, with dense buff-coloured pubescence; outer sepals ± ovate, 5.5–7 mm long, with dense buff to pale brown pubescence externally; corolla greenish-yellow or cream; lobes trifid; segments oblong-lanceolate to narrowly lanceolate, up to 5 mm long, with outer pair sometimes irregularly serrate near apex (very rarely bifid to base); tube up to 1.5 mm long; filaments up to 1.5 mm long; staminodes oblong-lanceolate, up to 4.5 mm long, acute; ovary densely pilose with short pale brown hairs; style tapering, up to 4 mm in length. Fruit a yellow or orange-yellow broadly ovoid berry, up to 2.5 cm long and 2 cm in diameter, with greyish flannel-like indumentum when young, later becoming glabrous, edible, sweet in taste. Seeds 1–3, up to 9 mm long, tending to be triangular in cross-section, obscurely ridged along the broader margin, and usually with a small basal projection; testa brown; scar ± basal. The fruits are sweet and edible. These are eaten out of hand. The wood is strong and used as timber as well as for many other purposes. Omuna is a forest growing plant and its trees are not planted for fruits. This tree does not seem to be on priority list of trees included even in forestry planting programmes. New plants can, however, be raised from seed.